Within the digital media environment, we nowadays live in, it is taken for granted that every piece of desired information will appear on your display within seconds. Even so, we are finger clicks away from matters being handled with the use of various applications while doing our daily groceries. Which is not a problem, considering that most of these transfers of information can often be regarded as harmless or not important. However, in cases that such transfers do contain sensitive matters such as medical information, that same accessibility can be considered to be a weakness in terms of our privacy. Byford stated that our need for information has led to numerous technological developments which allows us to gather, store and disseminate data about individuals (Joinson 34). Considering our current social environment, an example of this can be found in the mainstream use of multimedia messaging app WhatsApp, from which its functionality also has been proven in healthcare. Here, WhatsApp is often used in order to improve communication between medical staff to deliver better health outcomes for patients (Nikolic et al.). Research by Astarcioglu et al. pointed out that the popularity of Whatsapp can be derived from the fact that the application is seen as “cheap, quick, and easy to operate” (Kamel Boulos et al. 6). There are however also some pitfalls that can be distinguished, such as the absence of possibilities for extra logins and the possibility to share data with unauthorized people (Van de Sande). These flaws contribute to question if WhatsApp is the ideal application to share medical data and guarantee privacy at the same time. If the privacy of our data can not be guaranteed, there is a calculated risk that such sensitive information might fall into the wrong hands. Consequences may entail that this data can be used to generate consumer and communication profiles (Fischer‐Hübner 421) and therefore can be exploited for targeted marketing or associated product development, Houssain et al. concluded (Househ 32). Furthermore, as addressed by Banerjee et al., itcan be questioned if consent is given by the actual patient when the data involves personal information (49). This issue has been detected and has been processed into a new media object called Siilo, a secure messenger for healthcare (Siilo.com). 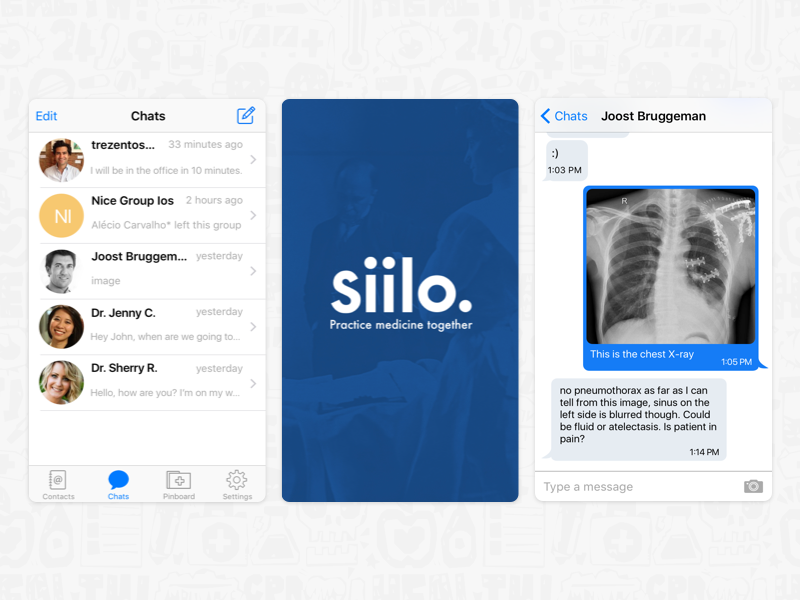 Siilo is an application that allows people in healthcare to communicate with each other about medical related cases in a confidential way. It differs from WhatsApp since it has built features in their application in order to properly secure its data and therefore to guarantee its privacy. The first obstacle that has to be overcome when opening Siilo, is that the phone can not be accessed without a correct PIN-code, fingerprint or facial recognition (Siilo.com). Only after successfully fulfilling this entry, the data can be accessed. One of the features also includes an ‘end-to-end encryption’ in the application, to prevent unauthorized people from gaining access to the data (Siilo.com). Furthermore, images, videos or files that are forwarded to one’s phone, will not be placed within the same folder as your personal content is stored. It is highlighted that there is also a blurring tool present in order to cloak parts of patient photos in order to protect patient identity (Van de Sande). The application does not make automated back-ups of your conversations. What it will automatically do, is that messages older than thirty days will be removed unless those messages are manually saved into the encrypted Siilo vault on your phone (Siilo.com). 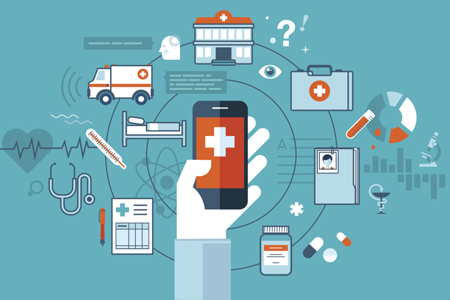 Mobile messaging applications reduce the time medical staff has to wait for diagnoses, its rapidness makes that they are extremely useful in healthcare. But although the sharing of medical information between medical staff is probably done with the best intentions, the risk of privacy remains a big issue and up for debate. This does not disregard the fact that the launch of Siilo can be seen as emergent. Especially since it draws upon privacy challenges that other current mainstream multimedia messaging applications do seem to lack or fail to anticipate on. With its application and safety measures, Siilo hereby offers great potential in minimalizing the risk of a data breach. However, if one must be critical, changing the surroundings through which data is transferred will still not guarantee absolute certainty of its privacy. This thought is shared by Altman, he stated that ‘’privacy regulation involves more than the use of the physical environment alone, but includes a variety of verbal, non verbal, environmental, and cultural mechanisms’’ (Stark, 17). One could argue that privacy possibly never can be guaranteed, how pure and well intended one’s intensions may be. So alleged secure systems are built, or in this case applications, often as a means to protect us and our data. But technology should make our lives more easy instead of making it more difficult than before. As Fischer‐Hübner described it, our economic opportunities should not diminish its social consequences (438). This taken into account, we as a digitalized society, should challenge ourselves to remain cautious instead of only to be blinded by the promising outcomes modern technology has to offer. Because the connectivity that is derived from it offers us many advantages in the field of being mobile, but it also makes us vulnerable at the same time. So let us be aware of the dangers of the technology we created ourselves, in order to transmit our data. Because if we are not looking out for the privacy of our data, who will? Banerjee, Syagnik, et al. ‘’Wearable devices and healthcare: Data sharing and privacy.’’ The Information Society, vol. 34, no. 1, 2018 pp. 49-57. Fischer‐Hübner, Simon. ‘’Privacy and security at risk in the global information society.’’ Information, Communication & Society, vol. 1, no. 4, 1998, pp. 420-441. Househ, Mowafa, et al. ‘’Balancing Between Privacy and Patient Needs for Health Information in the Age of Participatory Health and Social Media: A Scoping Review.’’ Yearbook of Medical Informatics, vol. 27, no. 1, 2018, 29-36. Kamel Boulos, Maged N., et al. ‘’Instagram and WhatsApp in Health and Healthcare: An Overview.’’Future Internet, vol. 8, no.3, 2016, pp. 1-14. Nikolic, Amanda, et al. ‘’The Use of Communication Apps by Medical Staff in the Australian Health Care System: Survey Study on Prevalence and Use.’’ JMIR Medical Informatics, vol. 16, no. 1, 2018. Siilo. Siilo, practicing medicine together. https://www.siilo.com/nl/. Accessed 19 September 2018. Stark, Luke. ‘’The emotional context of information privacy.’’The Information Society, vol. 32, no.1, 2016, pp. 14-27. Van de Sande, Michiel. ‘’How mobile messaging is providing faster and more cost effective care in hospitals.’’ Digital Health Age, http://digitalhealthage.com/how-mobile-messaging-is-providing-faster and-more-cost-effective-care-in-hospitals/. Accessed 23 September 2018. Learning via WhatsApp is what’s up! Medical applications, the brilliant health-care helper?